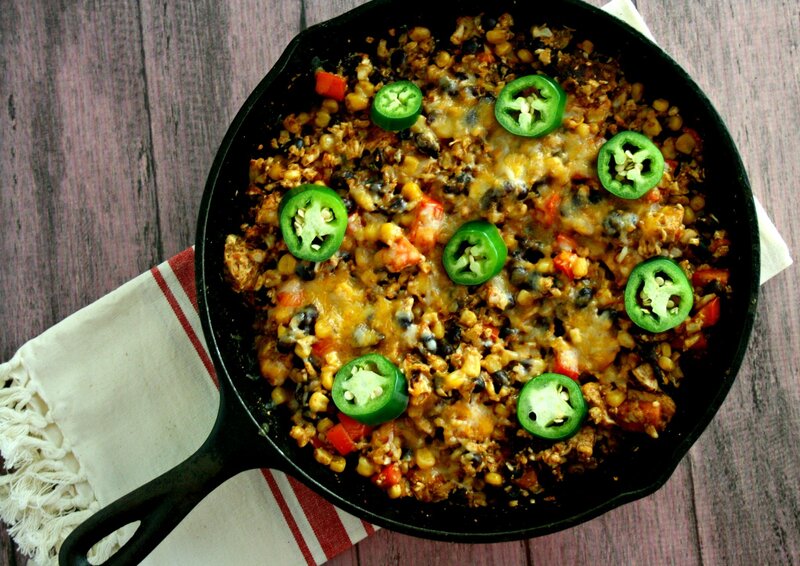 One skillet + 12 ingredients + 30 minutes = one delicious and nutritious dinner the whole family will love. My one pan Mexican cauliflower rice skillet is a nutrient packed meal that will have dinner on your kitchen table in no time. On-trend food from a can? Yes. It’s possible. Libby’s challenged Recipe Redux members to create an easy and unique recipe that shows just how simple and trendy canned foods can be. We were asked to pair a Libby’s Fruits or Vegetable products with one of Google’s 2016 Food Trends. My favorite 2016 trend is cauliflower rice. I can’t get over it’s versatility. From stir fries, simple sides, and casseroles- it’s the perfect low carb rice substitution. I don’t know about you, but my life seems to be a little more crazy than usual. I have been looking for simple recipes that require minimal clean up. 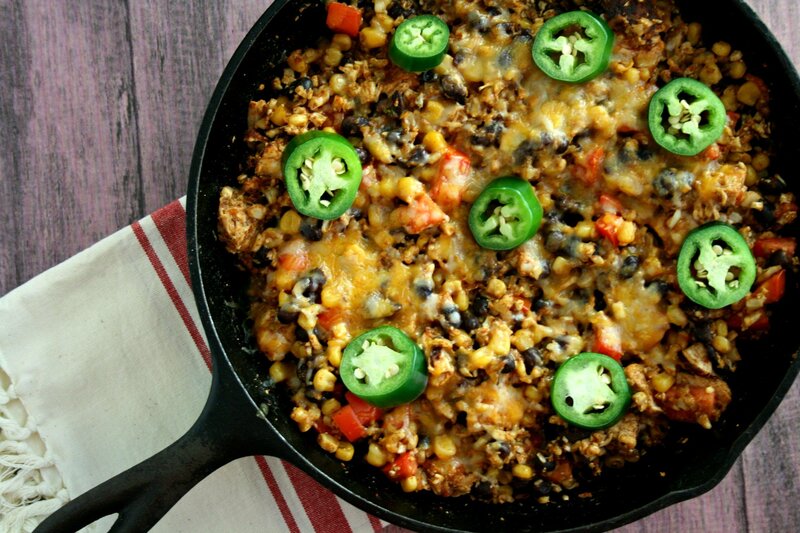 This one pan mexican cauliflower rice skillet is best week night dinner. Plus, if you’re just feeding two people it make great leftovers! Cooking with canned goods helps cut prep time in half. Adding Libby’s whole kernel sweet corn was a no brainer. It taste like it was just cut it off the cob. Since 1868, Libby’s wide variety of shelf-stable, conveniently packed, nutritious and delicious fruit and vegetable products having been helping busy families get fast, wholesome meals on the table without sacrificing flavor or nutrition. Dietitian Tip: Rinse canned veggies before using them to remove the excess salt they were packaged in. Do you have any favorite one pan dinners? If so, comment below with your favs! One skillet + 12 ingredients + 30 minutes = one delicious and nutrition dinner the whole family will love. My one pan mexican cauliflower rice skillet is a nutrient packed meal that will have dinner on your kitchen table in no time. Marinate 1 chicken breast in 1 tsp of olive oil and 1 tsp taco seasoning. Let sit for 30 minutes or as long as you can. Heat a larger cast iron skillet to medium heat. Add chicken and cook each side for 5 minutes. Take chicken out of the skillet and set aside. Add onions, garlic, and 1 tbsp olive oil to the skillet. Cook until the onions become slightly tender. Add the corn, beans, tomato, and cauliflower rice to the skillet and turn the heat down to low. Add the remaining taco seasoning and ¼ cup water to the skillet stir and cover. Cook for 3-5 minutes. Stir in lime juice and chopped chicken. Top with cheese. Recover and let the cheese melt. About 2 minutes.